Residents and visitors to the Cootamundra-Gundagai Regional Council (CGRC) have their food hygiene and safety inspection information literally in the palms of their hands, through Council’s participation in the voluntary state-wide Scores on Doors Program. The Program and mobile app was launched firstly in the Cootamundra area in 2012 followed by the launch in the Gundagai region in December 2016 as part of the increased level of services being provided through the recent Council merger. The purpose of the Scores on Doors program is to bring transparency to food hygiene and safety inspections, taking the guess work out of what’s really going on behind the scenes of your local café, take away, hotel or restaurant. Through the program businesses have the opportunity to show their customers that they take their food hygiene very seriously by displaying a Certificate within their business premises. 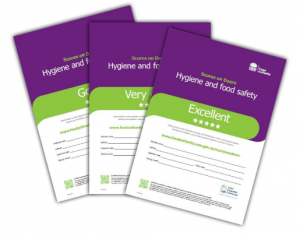 The Certificates when on display give customers information about the hygiene standards in food premises at the time they are inspected. Scores on Doors ratings recognise businesses with the highest standards and encourage others to improve. Click here for more information on the voluntary Scores on Doors Program.